My neighbor is a construction manager working on mall outside of Boston, Massachusetts. The mall is being built on a former apple orchard. The project has had some obstacles. The amount of arsenic in the soil exceeds acceptable levels by the EPA. The contaminated soil cannot be removed from the parcel of land which means the construction company must bury the soil under payment or mix it with uncontaminated soil to reduce the percentage of arsenic in the end product. When farmers spray pesticides, the unblemished apples, big red peppers or perfect melons all look so good. Beware the perfect fruits and vegetables because they may not be as perfect as you think. When the arsenic in the pesticide was sprayed, there was enough to kill small insects. As the rain fell, contaminates soaked into the soil. The apple tree’s roots absorb the chemicals. The accumulative effect has caused big problems for the developer. What has been the effect of the arsenic on you and especially on young children? It might be worth considering Square Foot Gardening. BEWARE: being an organic gardener may take some time to learn. Mel Bartholomew’s book Square Foot Gardening might be a good place to start. Warning, don’t just skim the book, read it. In Yoro, Honduras as well as a home we are trying to control mosquitoes using plants that are natural repellents. The url above shares with us the plants that can make a difference in our lives as well as in the lives of others in countries where the zika virus is a real threat to especially unborn children. Students at the Honduras Hope sponsored dormitory are propagating plants which will be shared with people whose homes are one room buildings without screens. Our goal is to turn the land adjacent to the dormitory buildings into a place to propagate these plants. The students are already growing food there. With their skills they will be able to grow useful mosquito repellent plants to distribute to people in other under served communities. The target homes will be those of expectant mothers. Genetically modified organisms, chemical fertilizers, pesticides, herbicides. They are probably all used to grow tomatoes in Honduras. This little boy will probably eat whatever he is fed. The dilemma comes down to something that is very simple: hunger. What would you tell that little boy about eating that tomato? The kale in the photo grew continuously for two years. (This photo was taken when I first planted this kale.) I haven’t added any compost or worm castings to the Mel’s Mix since the kale was first planted. I noticed in September that aphids were beginning to multiple on the leaves. Yesterday I ripped up and composted the kale; aphids were everywhere. I also planted a new crop of kale in a different location. There are no aphids on those plants. Disease attacks weak plants. The freshly planted kale plants are growing in compost, worm castings, vermiculite and peat moss. In a raised bed the soil mixture needs to be added to each time there are new plantings. With SFGs we are not using chemicals to fertilize the crops. When you pay more at the grocery store for organic crops there is a reason. We could have sprayed the infested kale, killed the aphids and then what remains are weak plants. In that case we would have been eating two things; plants lacking nutritional value and and the poison from the pesticides. These lettuce plants have made it through two nights of freezing weather. The past two mornings there has been an inch of ice around the house and yet look at the plants in the picture. Who knows what is in a seed? Labeling seed packages should be the right of consumers. Take a look in the mirror and ask yourself what you are currently doing. 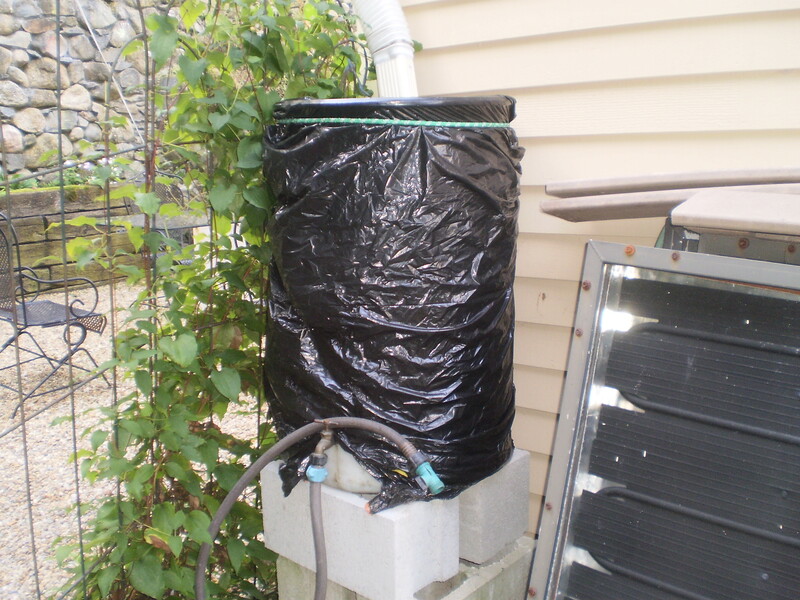 In most Massachusetts cities and town there are groups that sell and encourage the use of rain barrels. In South Carolina the drinking water is contaminated and people are desperate to find potable water. One rain barrel, and a Brita type water filter can provide a clean source of water from your roof. Just as extra safety, the water can be boiled as well. We currently use rainwater for our gardens. In case of emergency we have an amble supply of water from eight rain barrels around the house. You and I can ask government to find an expensive solution to water conservation or we might consider becoming proactive and a advocate for collecting water, reducing runoff and providing ourselves with an insurance policy if and when we experience a freak act of nature.